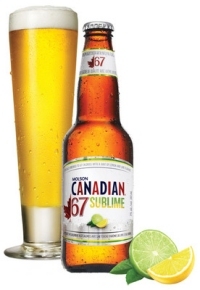 TORONTO, ON – In an attempt to combine two of the biggest recent trends in mainstream brewing – ultra-low calorie and lime/citrus flavoured – Molson Coors Canada has unveiled Molson Canadian 67 Sublime. Molson Canadian 67 Sublime is brewed with two-row malted barley, a touch of wheat, four different varieties of hops, and a hint of natural citrus flavours to provide a refreshing flavour combination of lemon and lime. Molson Canadian 67 Sublime is available now in Ontario and Western Canada, and will be rolled out across the rest of the country in June 2011. More details can be found on the Molson Canadian 67 website and Facebook page. One of the best beers now on the market. Previously a Bud fan…but no longer.